SDI Matrix Switcher Corporation WolfPack™ 1-Port SDI Input Card with an SDI Loopout works with our WolfPack SDI Modular Matrix Router card cage Touch Panel chassis. With 2 - screws you can easily add or remove this SDI input card to increase or decrease the number of single input 3G/HD/SD-SDI SDI input channels within the SDI matrix. It is a high-bandwidth card that supports a full 1920x1080p at 60Hz video resolution. The SDI card supports full SDI cross-point switching.It's a high-bandwidth card that supports different SDI formats including SD/HD/ 3G-SDI (adaptive). The card supports resolutions up to full HD 1080p. NOTE: This WolfPack™ SDI Input Card can be used in the WolfPack 10x10, 20x20, and 40x40 Touch Panel Chassis. Why not buy this WolfPack SDI Input Card today? 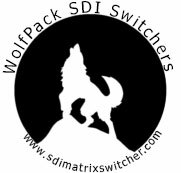 SDI Matrix Switcher Corporation includes a 2 Year WolfPackCare™ Advance Replace Limited Warranty on this SDI Input card. The warranty states that this SDI Input card will perform substantially in accordance with is specs for a period of 2 years from the date of the receipt of the order & that the SDI Input card will be free from defects in materials & workmanship under normal use. In order to get a warranty replacement for a defective item our Support Team will verify the product is eligible for a warranty. An RMA number will then be issued. Shipped SDI Input card replacements will be in like new conditions, tested and all components included. If a board or extender goes bad within the first 2-years and our Tech Support team verifys the problem after telephone to 833-WOLFPACK we will send a new or like-new card usually within 24-hours by USPS Air Priority at Matrix Routers Corporation expense. We may ask for a credit card for payment in case the bad card is not sent back to us within 5-business days. You will need to provide us the tracking number as we will to you and you will need to pay for the devices return.